Doing your tax return isn’t much fun is it? That’s why’ we’ve teamed up with ‘GoSimpleTax’ to ease the pain of self-assessment. Their cloud-based software does it all for you. It Asks all the right questions. It ensures you won’t have to pay a penny more to HMRC than you need to. And you know the best thing, they’re even doing a 14-day free trial. So what are you waiting for? Self employed, employed, landlords, non-residents and even Ministers of Religion. There is no need to be a tax expert. GoSimpleTax’s software is officially recognised by HMRC and ties in exactly with their requirements, so you don’t have to make any adjustments before you submit your tax returns. We'll prompt you to claim all applicable allowances. We will accurately calculate your tax bill. Your data is protected by the same 256-bit bank level security. Your data is backed up regularly. We're trusted by partners like Listetotaxman. We're officially recognised by HMRC. Access GoSimpleTax via laptop, PC, tablet or mobile device. 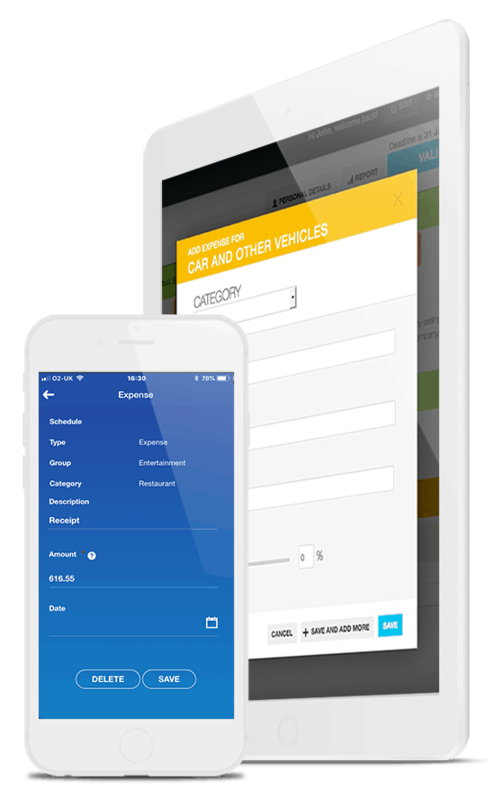 Our mobile app scans your receipts and invoices. Presented in jargon-free, intuitive design.